This motor is a little bit larger than the 3300 but with a shorter length. It also produces twice the torque. 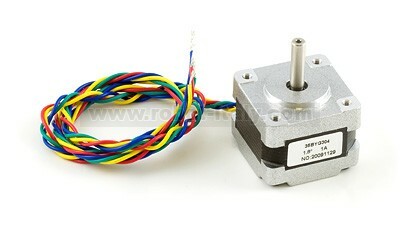 The motor is also very efficient in converting current into torque and velocity. 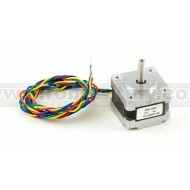 The 3301 stepper motor connects to the 1063 - PhidgetStepper Bipolar 1-Motor. The following table shows how to connect the motor wires to the board connectors to get clockwise rotation. To wire for counter-clockwise rotation, reverse the green and red wires. Note: Make sure to unplug the power cord from the 1063 before switching wires around.